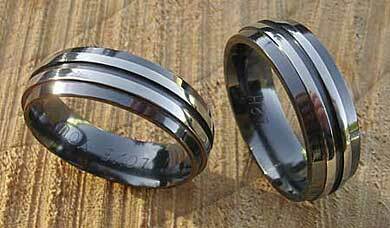 Two Tone Men's Alternative Wedding Ring : LOVE2HAVE in the UK! 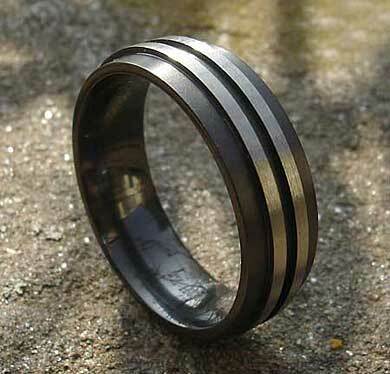 This men's wedding ring is just one of the many examples of our alternative two tone wedding ring designs for men. It comes based on a domed profile which is in fact quite subtle in shaping and has two wholly pronounced relieved stripes in a polished finish. It measures 7mm wide. As we explain on our site, black zirconium is in fact just an oxidised layer of black zirconium. Its exact colour is silver which is why using specialist tooling machinery the coating can be removed to reveal zirconium's natural colour underneath. 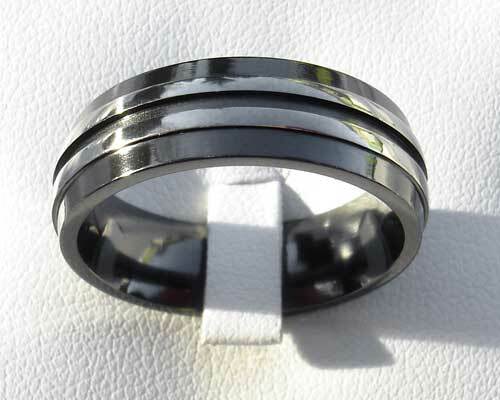 This ring is an excellent example of this technique as the two raised rails show the silver tone and make a real choice for men who want something different.